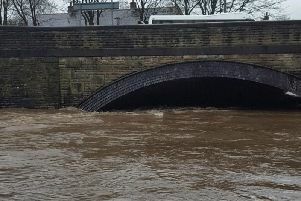 A young dad, who was forced to abandon his home with his partner and their baby son when floods hit Whalley for the second time this month, has praised the fire brigade and army for their swift response to the disaster. Ben Kenyon said the army and fire brigade worked together to lead many elderly residents to safety when Boxing Day floods brought more chaos to the village. Ben (27) who lives in Queen Street, said: “There are a lot of older people living here along and with no family and the police and fire brigade were very organised in getting them to safety. Despite assurances from other residents that Queen Street and the surrounding area had not flooded for over 60 years, the worst happened and dozens of homes were left thre feet deep in water after torrential rain which lasted all Christmas Day and overnight caused the River to burst its banks. Journalist Ben who lives with his partner Colette Ward-Thomas and their little boy Sonny evacuated their home when water started to lap against the front door. After moving as many possessions as possible upstairs to safety the couple went to stay with relatives.